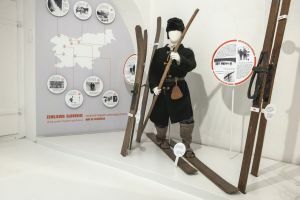 The modern museum exhibition shows how skiing developed from prehistoric times to the present day. Numerous skis are on display, from old skis from Bloke to the most modern ones, and all the remaining equipment: poles, boots and clothing. The old way of making shoes in wheelwrights’ workshops is also shown. Part of the collection is dedicated to the beginnings and development of skiing in Tržič with presentations of champions from Tržič: Jože Šlibar, Bojan Križaj, Andrej Jerman and Žan Košir. The ‘slalom of the famous’ is dedicated to our best Alpine skiers who achieved the best results in important competitions. For all lovers of skiing!